Kitchens are at the heart of modern homes, so space is at a premium. Yet there are many essential items and appliances that need to be located in the kitchen. If you're thinking of redesigning your kitchen, shop around and get at least three quotes, as the cost of the design and installation can vary widely. Much is spoken of the 'golden triangle' principle of kitchen design and there are many variations on the theme, but the over-riding common sense principle is that the most used equipment and work areas should be grouped together to allow the user to operate effectively and efficiently while cooking. The problem with the triangle theory is that individuals rank their most used equipment differently. Some would choose the cooker, refrigerator and sink, others might add a dishwasher or microwave as their most used items. It's unlikely that the plumbing for a sink or dishwasher could be altered easily, so these items should anchor the 'triangle'. Kitchens invariably suffer storage problems - too little and surprisingly, too much. Too little - if you don't have the cupboard space for everything you need to store in your kitchen, consider creating a suspended pot rack that makes use of ceiling space. Don't forget that the tops of eye-level kitchen units form extra shelf and storage space, though the items are less accessible and prone to dust. Too much - just as it's a shock to hear a room can be too large, some kitchens are designed with too much storage space. Clutter expands to fit the cupboard space available. Throw out unused fondue sets and a sell-by date check can often halve a grocery collection. Banks of cupboards are unnecessary and unattractive in a kitchen and disposing of some may leave space for a breakfast bar or another appliance. Plumbing and electrics are involved, as well as cupboard assembly. Rescuing a botched job could be more expensive than a full installation fee. 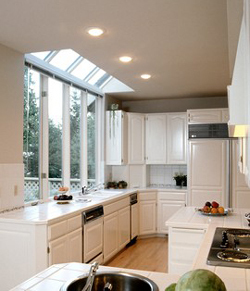 Shop around, the price and quality of units varies widely, as do installation charges.